NEW YORK (February 18, 2015) — In an effort to stop tuberculosis (TB) from becoming progressively less treatable worldwide, the National Institutes of Health has awarded Weill Cornell Medical College more than $6.2 million in first-year funding to support a research collaboration among six institutions in close alliance with voluntary pharmaceutical partners. The total funding, provided by the National Institute of Allergy and Infectious Diseases, could be up to $45.7 million over seven years. 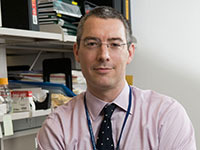 Dr. Michael Glickman, an infectious disease specialist and Alfred Sloan Chair at Memorial Sloan Kettering Cancer Center, serves as the TB Research Unit's co-principal investigator. He notes that TB is the single leading cause of death from a bacterial infection, and the second leading cause of death from any pathogen. One in three people globally is infected with the bacteria that cause TB. Of those people, between 5 and 10 percent eventually develop the active disease. Each person with an active case of untreated TB may go on to infect 10 or 20 additional people. There are millions of infections and deaths each year from TB — in 2013, an estimated 9 million new cases were reported and 1.5 million people died, according to the World Health Organization. With the help of patients at Weill Cornell's GHESKIO clinic in Haiti, overseen by Weill Cornell physicians Drs. Jean Pape and Daniel Fitzgerald, researchers will investigate biological factors that affect the course of TB infection — and likely treatment. For example, a participating group of researchers from Rockefeller University led by Drs. Jean-Laurent Casanova and Laurent Abel have found a gene that appears to control susceptibility to reactivation of TB infection in young adults. They will search for other such genes to help explain why only a minority of individuals with latent infection develop clinical disease, while the majority remain disease-free. Dr. Glickman's group will study the expression of genes by blood cells that may provide markers of resistance to initial infection and an early indication of treatment response. He will also investigate the effect of special types of lymphocytes and the role of composition of the intestinal bacteria in resistance to infection and response to therapy. Dr. Nathan's group, working with Dr. Fitzgerald, will study a subset of TB bacteria in patients' sputum that is undetected by standard techniques but may be largely responsible for persistence.